Do you know someone who is having a hard time this holiday season? Maybe they are having health problems, experienced a loss, are not able to get out, or are away from family and friends for the holidays. I think we all know someone who could use a little extra love this year….maybe even someone we don’t know. Each year during the Christmas season my husband and I try to do something for someone or a group of people that will bless them with nothing expected in return. It really helps us to remember what the season is all about. Even though I said we expect nothing in return, we are truly blessed from it. Something that we have done in the past and are planning on doing this year is what we call the “12 days of Christmas” We usually pick a person or family that we want to bless and then buy 12 small gifts for them and wrap them in pretty paper. Then place them all in a larger bag. We deliver them to the person before the 14th and explain that each day starting on the 14th they will unwrap a gift a day until Christmas. You could also just put a note in the bag explaining what to do and leave it on their doorstep anonymously. The gifts do not need to be expensive, they could even be a note or small treat. If it is for an older person they would appreciate practical things such as a notepad, soap, crossword puzzles, stamps etc.. If you are doing it for a family it could be something that would create an activity for the family such as a card game, movie, or bag of cookie mix and a few cookie cutters. You can vary the concept to suit you, maybe do it for seven days, or once a week until Christmas, or from Christmas until the New Year. If you lived close enough you could slip a package on the persons doorstep each day. The idea is to let others know that they are being thought of each day and loved. I had done this for my mother the Christmas after my stepfather passed away, not knowing it would also be her last Christmas. She enjoyed opening the gifts each day and would tell me about them when she called. Each day she would tell her friends at the center about the little gift she would receive. She passed away in February and at her services a friends of hers told me what a wonderful thing I did for my mother that Christmas. When I cleaned out her apartment I found a list of the gifts I had given her each day. I am so glad that I made her last Christmas special….it really doesn’t take a lot to do that for someone. I hope this post stirs your heart and gives you ideas of someone that you can bless….and in turn be blessed. PSS. 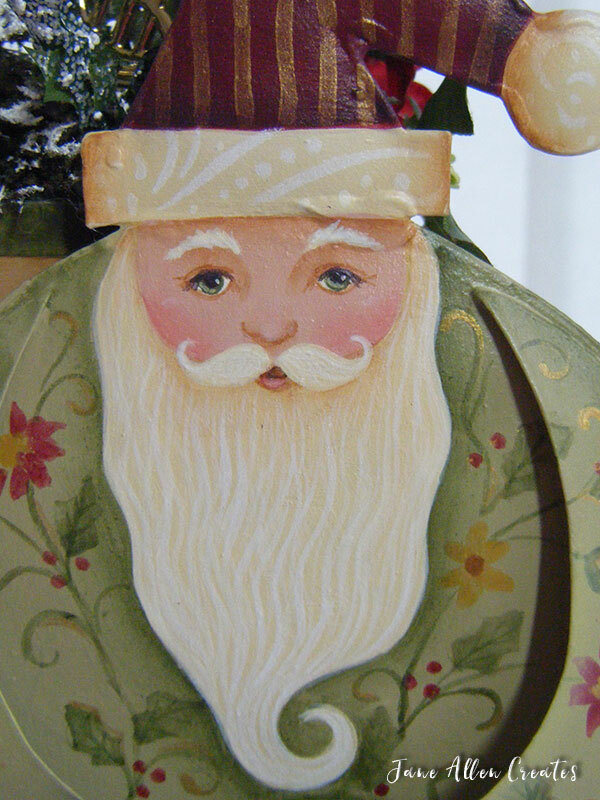 This Santa that was in PaintWorks was inspired by my mother’s love of gardening. What a wonderful “blessing” to do for the holidays! Thank you Lynn, we are the ones that are truly blessed. Inspiring and lovely idea and story of the true meaning of Christmas! Thank you Effie, may the work of your hands be blessed this year! You do such neat things Jane! YOU are a blessing to all of us! Thank you Gail, your words bless and encourage me.